This amazing postcard of Batty the cat (aptly named - look at those ears!) 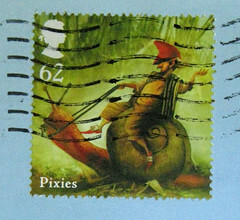 came to me from the venerable PostMuse, and it has to be one of my favorite postcards ever received. A black cat (named Batty) plus a typewriter - what could be better? 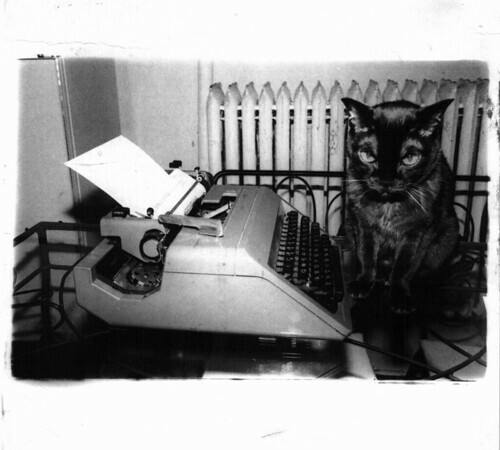 It is from the series "Funny Cats Postcards" from Stewart Tabori & Chang, and this photograph is called "Writer's Block" by Joyce Ravid in 1992. Batty looks like she is ready to type, or berate a writer for not typing! Love this card!! And what a look - I would immediately stop doing whatever I was doing and do what Batty said I should do... no wait, he's a cat!! Rather late to comment, but I just discovered your excellent blog. We have a cat named Batty as well! Never too late to comment, Deaconess Jane. Cats named Batty are bound to be awesome.